This book basically follows the ups and downs of the relationship between Aya, an average, somewhat silly 2nd year high school student, and her new boyfriend, a first year student named Kei. 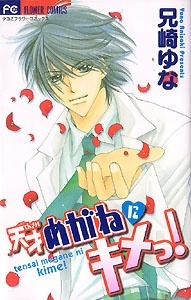 Kei is a super genius student and is really popular with all the girls. Beauty and brains in one guy! At the beginning of the book they have been dating for about 2 weeks, and Aya is so happy to have him as her boyfriend. As for Kei, all he can see is Aya. He is remarkably patient with her and cares for her very much. It really just follows their relationship, as they have some misunderstandings, arguments, and make up. But Kei is such a cool boyfriend to have~! And he has a rather… inventive way of showing the entire school how much he likes Aya… There is a separate story at the end of the book that shows how Kei and Aya met and first started dating.